The annual Carnival festival in Trinidad and Tobago is one of the biggest and most well-known celebrations in the Caribbean, drawing thousands of visitors from around the world to the islands' capital city, Port of Spain. The party is extremely popular with locals, Trini expatriates, and tourists alike, so you need to get an early start on your planning if you want to get a good hotel or guest-house room for your stay. The main celebration of the Trinidad and Tobago Carnival Festival takes place in February or March each year on the Monday and Tuesday before the first day of Lent, which coincides with Ash Wednesday. However, you can find locals preparing and partying for months leading up to the main event, and the real party usually starts on the Friday before Lent. Traditionally, this has meant that most Carnival events have taken place in February (February 27 to 28 in 2017, February 12 to 13 in 2018, for instance). In 2019, however, the carnival will take place from March 4 to 5 before returning to a February schedule the following years (February 24 and 25 in 2020, February 15 to 16 in 2012). 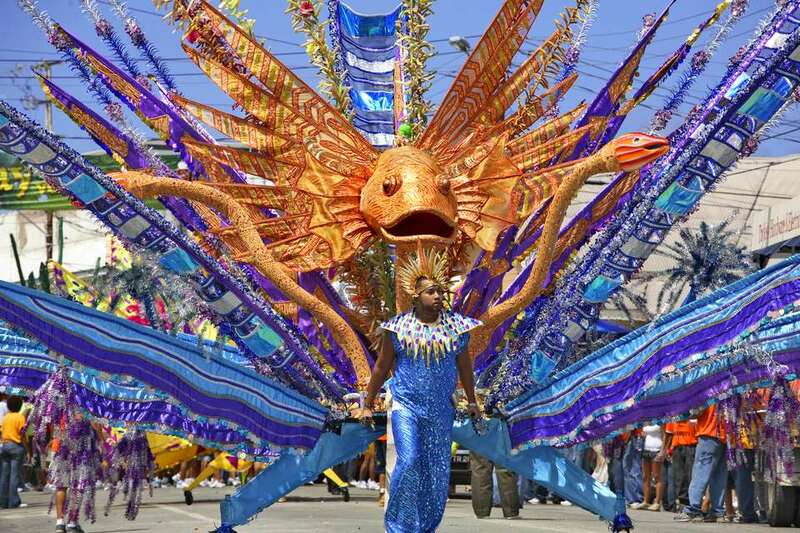 Like most Carnival events around the world, the annual celebration in Port of Spain honors Western Christian and Greek Orthodox cultures with a festival of indulgence before the official start of Lent (when practicing Christians fast for the six weeks leading up to Easter Sunday). However, this isn't to say Carnival is a religious event as it largely encourages participants to drink rum, party (fete), and get a little wild for the weekend. Instead, Trinidad and Tobago's Carnival is mostly a celebration of Caribbean culture where you'll find everything from giant parades to entertainers in elaborate costumes known as "mas" and performances by local calypso and Soca musicians. You also won't want to miss the various competitions taking place over the weekend and culminating on the last day of the festival, including the crowning of the Calypso Monarchs (the King and Queen of Carnival) during "Dimanche Gras" on the Sunday before Ash Wednesday. While you're almost certain to find some sort of party or celebration in Trinidad and Tobago for months leading up to Carnival, the official festivities kick off on the Saturday before Lent with the finals for the National Panorama competition, which pits steel pan drummers against one another in categories ranging from "Single Pan Band" to "Conventional Steel Band." On Sunday night, known as "Dimanche Gras" (Shrove Sunday), representatives from calypso and Soca bands compete in an over-the-top costume contest for the honor of being named the Calypso Monarch. Each year during Dimanche Gras, a king and queen of the bands are chosen by a panel of judges and the audience's cheers to represent the Carnival for the rest of the year. The masquerade party known as "J'ouvert" ("Dirty Mas"), which means "opening of the day," takes place just before dawn on Monday and features revelers with costumes satirizing current events; a King and Queen of J'ouvert are chosen based on whoever has the most clever political or social pun. Following J'ouvert, Carnival Monday continues with the parade of mas bands in the day, which is followed in the evening with a competition for the best performer at Carnival. Tuesday is the biggest day of the event. Revelers dress in full costume—with bands usually dressed in a particular group theme—and parade through the streets to the Queen's Park Savannah, where participants are judged for best mas band costume and individual street parade costume and the Road March King or Queen is crowned for the singer with the most-played song. Celebrations and festivities on Tuesday last until just before midnight leading into Ash Wednesday, and although it's not an official holiday, many people take the following day off to enjoy the beach and recover from the full weekend of dancing, partying, and taking in the Caribbean culture of Trinidad and Tobago's Carnival Festival.